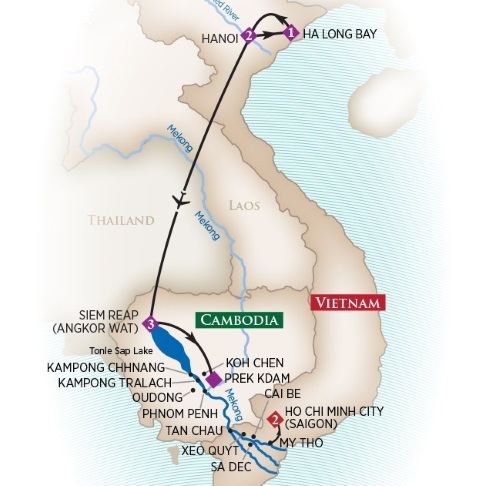 Your journey begins in Vietnam’s capital, Hanoi, followed by an excursion to breathtaking Ha Long Bay for an overnight stay aboard an elegantly appointed ship. A short flight to Siem Reap, Cambodia brings you to the gateway of the ancient Khmer empire where you’ll explore the temples of Angkor Archeological Park. Embark on your Mekong River cruise and visit rural villages, pagodas, local markets and a Buddhist monastery along the way. Conclude your cruise with a two-night stay in lively Ho Chi Minh City. Port Charges not included in cruise price: $168 per person. Intra-Asia Air (Hanoi - Siem Reap): Additional $360 per person including taxes and fuel surcharges. Siem Reap Embarkation Day: During low water season, transfer from Siem Reap to the ship via motor coach to Prek Kdam, a small village on the Tonle River. Siem Reap Disembarkation Day: During low water season, disembark the ship at Prek Kdam, a small village on the Tonle River, and transfer via motor coach to Siem Reap.